If your memories of drinking Jägermeister are a bit hazy, you're not alone. The herbal liqueur has long been a frat party staple with a (somewhat unfair) reputation for tasting gross and a certain association with, uh, overindulgence. However, in an effort to get people sipping it for pleasure as full-grown adults, the brand just unleashed its first-ever premium version, which boasts a slightly less intense "whoaaaa" factor than the original. In other words, there's a new Jäger in town, and it's actually kind of great. A close cousin to the traditional herbal liqueur introduced more than 80 years ago, Jägermeister Manifest is the first "super-premium" spirit from the brand. The new version is specially crafted by adding even more botanicals to the classic recipe, which already features a blend of 56 natural ingredients that give the dark brown booze its spicy flavor. However, rather than evoke the same intensity of the original, the addition of new herbs, blossoms, roots, and fruits hits a bit softer thanks to a longer maturation process of 12-plus months in small and large oak casks. Much like other premium herbal liqueurs, Manifest is meant to be served neat, and enjoyed as an aperitif or digestif. Or, hey, you could get creative and try adding it to cocktails. 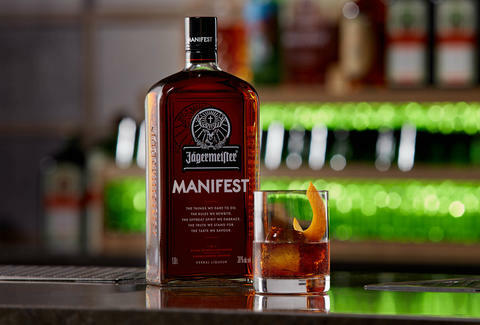 Jäger does make a very limited time seasonal offering called Jägermeister Spice, but Manifest is the first spirit the brand has ever added to its permanent lineup, and the first "premium" booze it's ever created. Essentially, it's appealing to those who've moved on from their Jäger bomb days and are looking for something more sophisticated to sip on. Since the aging process takes a bit longer, there's only a limited run of Manifest up for grabs at the moment, but if you're up for giving it a shot (though, not necessarily taking one), select retailers should have it on hand for about $60 a bottle.